Hamas chief Khaled Meshaal on Saturday praised Turkey as a "source of power" for all Muslims in gratitude to Turkey's leaders for supporting the Palestinian cause. 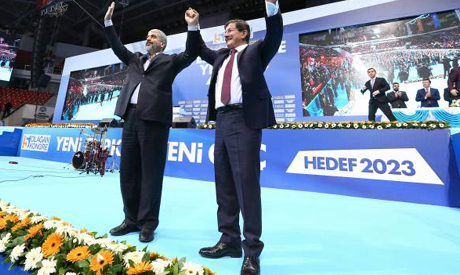 "A democratic, stable and developed Turkey is a source of power for all Muslims," Meshaal said in an address to the ruling Justice and Development Party (AKP) annual congress in the conservative central Anatolian city of Konya. His brief address was interrupted repeatedly by cheering crowds in the hall waving Turkish and Palestinian flags and chanting: "Allahu Akbar (God is greatest)" and "Down with Israel!" The Hamas chief often shows up at the ruling party's events. He also attended the AKP's congress in 2012 when President Recep Tayyip Erdogan was serving as prime minister. Current Prime Minister Ahmet Davutoglu, in his speech said Turkey's red flag featuring a crescent with a star was a "symbol of the innocent in the world." "God is witness ... we will make this red flag a symbol of the innocent. This red flag will fly side by side with the flags of Palestine, free Syria and all other innocents' flags anywhere in the world," he told the congress. Turkey's leaders, in particular Erdogan, are known for their angry outbursts at Israel. A staunch supporter of the Palestinian cause, Erdogan has often blasted the Jewish state over its military assaults on the Gaza Strip, which is ruled by Hamas. A terrorist... AND that he is only admired by fellow terrorists. Turks have been persecuting Kurds for over a century, now its going to bite them.